It’s possible to simply disable USB ports support in PC BIOS in order to prevent and forbid computer user from using USB removable flash drive or mass storage device (portable hard disk drive) to copy and transfer data and files. However, disabling USB ports on hardware level totally also shutdown the ability for system to use USB based keyboard, mouse, webcam, printer, scanner, smartphone and etc, which has become a common connectivity norm in modern computer. As a workaround, use the following registry hack to stop USB Mass Storage Device drivers from starting when the system boots up. To revert and re-enable the drive access for removable USB mass storage device driver, change back the value data for Start to its original default of 3, which enables all removable drives. The change will take effect immediately to block any USB mass storage device such as USB flash drive, USB key and portable hard disk from been used in the system, while still allowing hardware components to work properly via USB connection. The hack works in most Windows operating system such as Windows Vista, XP, Windows Server 2008, 2003 and 2000. 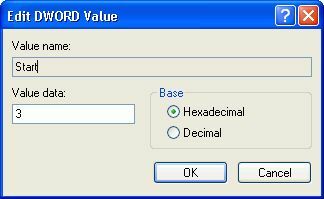 For user who dare not to modify the registry manually, simply download the following registration entries file to enable or disable the USB drive. Extract the downloaded content in .ZIP format, and then double click on the .REG file to open and apply or merge the registry values to system. 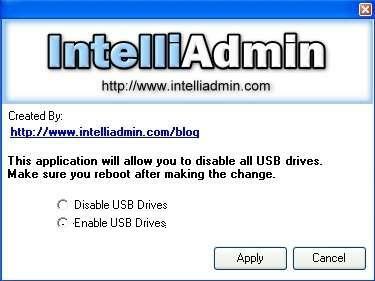 IntelliAdmin also has a free tool named USB Drive Disabler that automatically change the registry key value accordingly to enable or disable the USB drives on Windows client and server system with just one click. In Windows Vista, Windows 7, Windows 8, Windows 8.1, Windows 10 or later and their server equivalent, the program has to be run as administrator. Select Disable USB Drives or Enable USB Drivers and then click on Apply to set the registry setting accordingly.